See also the C-SPAN video: Mario Cuomo Urges NY Constitutional Convention. Description: Mario Cuomo attributes the failures of NY state politics on a flawed state constitution, and describes a state constitutional convention as “the only way” to solve the problems facing the state. “State government’s dysfunction, corruption, and fiscal irresponsibility are still the ultimate trump card that can mobilize public opinion and serve as an urgent call to action. As symptoms of these “cancers” on government continue to manifest themselves…, the “case” for convening a constitutional convention will be self-evident…. –Kolb, Republican Leader, New York Assembly, “New York’s Last, Best Hope For Real Reform: The Case for Convening a State Constitutional Convention,” Albany Government Law Review, 2011. –Anthony Weiner, former member of Congress from New York City, WNYC.com, August 31, 2015. –New York Times Editorial, From The New York Convention Con, New York Times, August 8, 2010. –-Peter G. Goldmark, Jr., President, Rockefeller Foundation, Cited in Decision 1997, p. xiii. –Peter J. Galie & Christopher Bopst, House Cleaning the New York Constitution, Albany Law Review, 2014, p. 1388. The idea… is to prevent the great moneyed corporations of the country from furnishing the money with which to elect members of the legislature… in order that those members of the legislature may vote to protect the corporations. 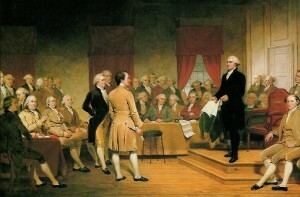 It is to prevent the great railroad companies, the great insurance companies, the great telephone companies, the great aggregations of wealth, from using their corporate funds, directly or indirectly, to send members of the legislature to these halls, in order to vote for their protection and the advancement of their interests as against those of the public. It strikes, Mr. Chairman, at a constantly growing evil in our political affairs, which has, in my judgment, done more to shake the confidence of the plain people of small means in our political institutions, than any other practice which has ever obtained since the foundation of our government…. And I believe that the time has come when something ought to be done to put a check upon the giving of $50,000 or $100,000 by a great corporation toward political purposes, upon the understanding that a debt is created from a political party to it; a debt to be recognized and repaid with the votes of representatives in the legislature and in Congress, or by the action of administrative or executive officers who have been elected in a measure through the use of the money so contributed.